Now that the Guardian exposed the criminal scheme of Azerbaijan leadership, it all comes to its places. Irina Bokova - the chief of UNESCO felt the urge to organize a symposium on how tolerant Azerbaijan is only after the chief criminal Ilham Aliev send his thugs to destroy medieval Armenian cemetery and thus annihilate more than 10 000 Cross stones (khachkars) declared by the very same UNESCO in the 70s of the last century as World cultural heritage. In the process her husband Kalin Mitrev, was paid 450 000 pounds by an Azerbaijani company registered in London for consultancy services. Corrupt to the core and no one cares or asks questions, the new world democracy at work. Where is the MONEY! Azerbaijan is committed to the UNESCO principles, Director-General of UNESCO Irina Bokova said. Bokova made remarks a meeting of the National Commission for UNESCO, dedicated to the 25th anniversary of establishing the relations between Azerbaijan and UNESCO, in Baku May 6. Edited by onjig, 06 September 2017 - 09:56 PM. "Azerbaijani Foreign Minister, Chairman of the National Commission for UNESCO Elmar Mammadyarov called the cooperation between Azerbaijan and UNESCO fruitful and mutually beneficial." Couldn't put it better!!! Djulfa.com has consistently criticized UNESCO Director-General Irina Bokova’s unflinching and hitherto inexplicable support of oil-rich Azerbaijan, despite the latter’s deliberate desecration of ancient archeological sites. As such, we are outraged yet unsurprised to learn from The Guardian’s September 4, 2017 report that Director-General Bokova’s husband has received over half-a-million-dollars as part of an all-too-obvious Azerbaijani ‘quid pro quo’ corruption and money laundering scheme. 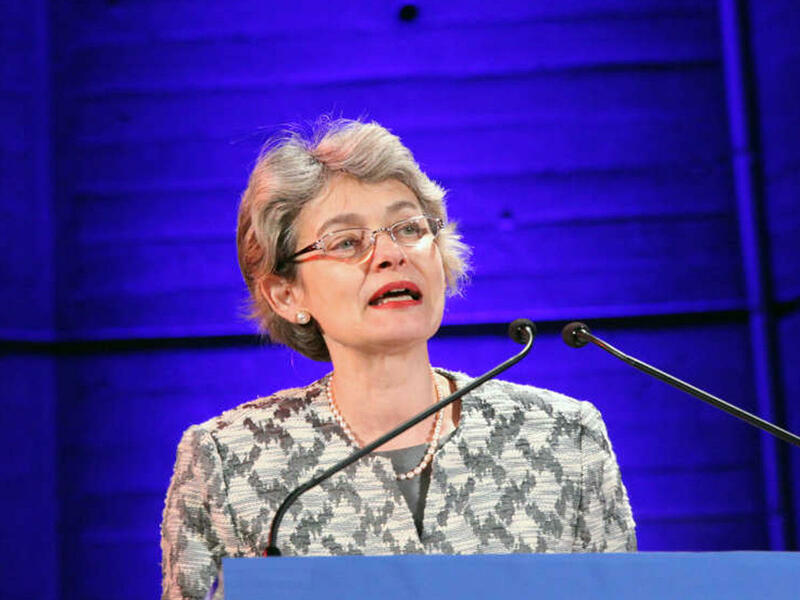 In November 2013, four months after accepting a $5 million donation from Azerbaijan on behalf of cash-strapped UNESCO, Irina Bokova helped unveil the absurdly-titled “Azerbaijan: A Land of Tolerance” exhibit in Paris, where the organization is headquartered. She has since made several trips to the Azerbaijani capital for the ‘Baku World Forum on Intercultural Dialogue;’ praised president Ilham Aliyev for “fostering new forms of dialogue between cultures;” allowed Azerbaijan to appoint UNESCO staff as “loaned personnel;” and has given Aliyev a platform at the UNESCO Leaders’ Forum to lecture the world on tolerance and shift the blame of cultural genocide to Armenians. That Azerbaijan, a top jailer of journalists ranked as the world’s 5th most-censored country, is no land of tolerance is widely-known, but few are aware of its state-sponsored eradication of the region’s vast medieval Christian heritage. Since inheriting the presidency from his father in 2003, and emboldened by Azerbaijan’s oil-revenues due to the 2005 launch of the Baku-Tbilisi-Ceyhan pipeline, Ilham Aliyev has spearheaded the complete destruction of Western Azerbaijan’s entire medieval Christian heritage – consisting of hundreds of churches and thousands of cross-stones – due to the latter’s association with the region’s indigenous Armenian civilization. While Azerbaijan’s destruction of Armenian monuments started in 1988 following widespread calls for the return of Armenian-populated Artsakh (Nagorno-Karabakh) to Armenia as the Soviet Union was collapsing, the systematic eradication of every trace of medieval Armenian memory was launched and completed nearly two decades later under the current presidency. In December 2005, alone, over one-hundred Azerbaijani soldiers carried out a week-long operation to obliterate the world’s largest medieval Armenian cemetery – Djulfa, an archaeological wonder that also constituted Eurasia’s largest collection of historic Christian cross-stones. Despite eyewitness video and photo evidence, verified by the American Association for the Advancement of Science through satellite analysis, the Aliyev regime denied the destruction of Djulfa, claiming that the cemetery never existed in the first place. According to Research on Armenian Architecture, a nonprofit institute that meticulously documents medieval monuments in the Caucasus, Azerbaijan has bulldozed and flattened 218 medieval Armenian churches in Nakhichevan – the region that includes Djulfa. In comparison, according to the Assyrian International News Agency, ISIS terrorists have destroyed a mere 16 churches in Syria, many of which may be subject to restoration upon liberation. Despite conclusive evidence to the contrary, the Aliyev regime proclaims that it preserves Armenian heritage by pointing to the physical existence of a state-confiscated 19th-century Armenian church in downtown Baku, while unfoundedly accusing the twin states of the Armenian homeland – Armenia and the internationally-unrecognized republic of Artsakh – for the systematic destruction of Islamic monuments. While Irina Bokova has repeatedly and justifiably condemned ISIS vandalism of Assyrian, Christian, Islamic, Yezidi, and Hellenistic sites, she has failed to do so in the case of Azerbaijan’s state-sponsored, deliberate, and systematic targeting of medieval Armenian monuments despite UNESCO’s awareness of Djulfa’s destruction, as evidenced by its World Heritage Centre director Francesco Bandarin’s 2011 official correspondence with our organization. General-Director Bokova’s general cooperation with a regime that has destroyed more Christian heritage than ISIS might have been necessitated by America’s 2011 defunding of UNESCO, an unfortunate circumstance brilliantly analyzed by former Daily Show correspondent John Oliver. But her husband’s personal acceptance of laundered money from Azerbaijan appears to shed a light on Irina Bokova’s intransigent refusal to acknowledge, let alone seek accountability for, Azerbaijan’s destruction of medieval Djulfa and other monuments of the region’s ancient Armenian civilization. In light of her husband’s connection to the recently-revealed Azerbaijani money laundering scheme, we call on Director-General Bokova to resign before November’s expiration of her second and final term. Additionally, we call on Director-General Bokova to publicly oppose the Aliyev regime’s candidate for UNESCO director-general, Polad Bülbüloğlu, who was Azerbaijan’s Minister of Culture at the time of Djulfa’s destruction. Funny but that place was never great before. Where is the money?